This is the standard download that will allow you to setup StarReminder on your PC and start it automatically with Windows. The portable version is a zip file that does not need installation. Suitable for computers where you do not have administration permissions. We use MyCommerce as our payment processor for secure online and offline payments. StarReminder gives you reminders and alerts for specific dates and times. With the advanced (but easy to use) scheduling options you can setup recurring reminders (hourly, daily, weekly, monthly, yearly, etc.). You can add on-screen notifications, e-mail delivered reminders and sound alerts. You can even make StarReminder to automatically perform computer tasks for you, for example, to run a program and log off, shutdown or restart Windows on specific days or times. If you travel a lot or use computers both at home and work, you can take StarReminder with you. We have made StarReminder able to install on a flash USB disk so that you can take it with you and run it on any computer that you visit. An easy reminder utility, allows you to add simple or complex alert schedules. 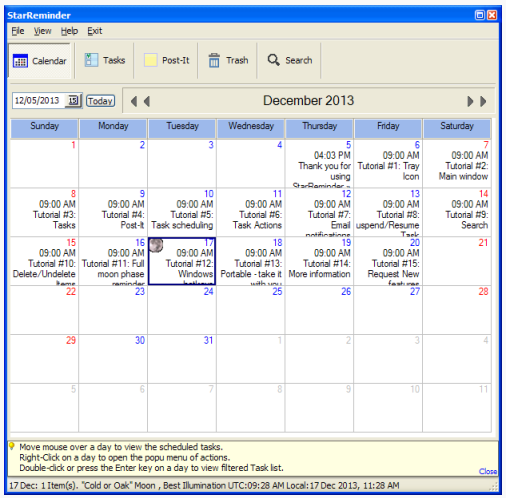 StarReminder is designed to be a Portable software. Always carry your reminders in your pocket by simply installing it on any normal USB disk and view your Tasks, todos, anniversaries and notes in any computer, anytime. StarReminder runs on the background, without interfering with your work until a Task reaches its due Date/Time schedule that you have previously set. 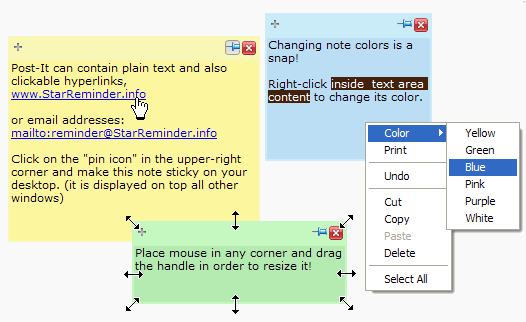 You can access any of StarReminder's functions by clicking or right-clicking on its tray icon. A window popups on screen when a Task (or a number of Tasks) reaches its due Date/Time. The window contains a list displaying Tasks Title and Date/Time schedule. Extensive Task handling is available adding functionality and speed to your work. You can configure StarReminder to send email notifications when a Task reaches its due Date/Time. For example you or a friend of yours can receive email notifications for a meeting you planned. With the email notification it is easy to organise also other people that do not have StarReminder installed. If the moon cycles are important for you, an email notification can be sent three days before each full moon of each month. The email contains the full moon name and detailed description for each month's full moon phase along with the best illumination in UTC time. Get rid of paper floating around your desk. These virtual post-it notes are as easy to use as paper and far more flexible. They can store unlimited plain text content and they can be placed to your Windows' desktop or in the Post-it memoboard tab. They don't disturb you when using other programs. You can easily drag them anywhere in your desktop or roll them up in order to save screen space. Changing note colors is a snap. If you travel and use StarReminder on a USB stick, the post it notes will follow you in your trip. Use the Post-It tab to create and edit memo notes. Instead of leaving a Post-It open on screen you can close it and find it in the Post-It tab in the main window. You can store unlimited text and automatically highlights any URL addresses to websites. You can colot-code the memo notes to filter them by color and distinguish their content. I have just downloaded and installed this Shareware StarReminder, and am quite happy with it's many features. I especially like the fact that notes of up to 250 characters can be input. I find this is very useful, as the last freeware program I tried only had room for a line or so of characters. I intend to use it for when to change my engine oil, pay bills, etc. Mundane but essential tasks I want to be reminded of. Thanks for such a wonderful utility! I really love this program. It's so easy to use. When I searched, I found two that had caught my eye. But I downloaded StarReminder first, and was so happy with it, that I never looked at the other one. Thank you for creating 'StarReminder'! It's a really great program! It's helping me not forget things, and schedule things on a regular basis for my business and personal life. Thanks again! My sincere admiration for the program. I got this from a kind friend, but I feel I have to commend you on it. What I can suggest if I may, and at your disposal, is a sort of recycle bin to keep old tasks, which could be recycled but has an built-in delete option after sometimes. Thus for tasks which may not be useful for the moment but may be useful in the future and may or could be retrieved. 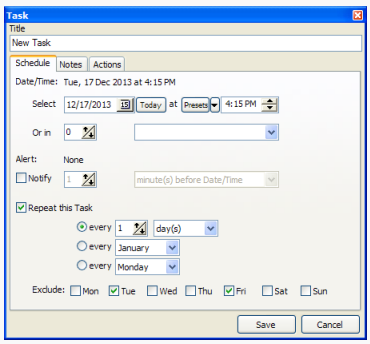 Moreso, it leaves the window for tasks uncluttered even if all tasks are displayed. This would necessitate to open window to show only the content of the "Recycle bin". Like in my case, I dont want to delete your instructions in your POPUP NOTES. But I wish I could keep it in a bin somewhere within the program. But this is a minor concern! I find it a small program but a genius! Thanks to my friend, BUT THANKS TO YOU! already tried out some other reminders but after trying this one I don't use anymore of those other programs. Very nice work done there folks. I am very impressed so far with your software. It was easy to install and it seems very easy to use. Great job! I plan to tell everyone at the office! Well I have been looking for something of this nature for a while and have found some but not as good as yours I now have a few problems remembering things so this is ideal for me. I find this programme ideal as a reminder to do everyday tasks. I wanted something that would pop up on the screen on a particular date and remind me to do something important. This programme is perfect for me. Was looking for simple program to remind me of important tasks. This program does that very well and with minimal fuss. StarReminder has a nice clean interface. Easy to use, unobtrusive when it pops up. I have to tell you guys, I had a problem and emailed the support team of StarReminder and the problem was fixed in minutes, yes you read that right in minutes unbelievable. I have been using StarReminder for years and years, there are no fancy frills on the software it just does what it says on the tin and for a stupid price of $9.99 complete bargain. Guys just bye it you will not be disappointed at all. Best program out of its type I found, I downloaded about 20 different 'alarm' programs and have deleted all except this one. Is it possible with MAC computer ? Any Idea why I received the following error when installing? Internal error: Failed to expand shell folder constant "userdocs"
You could try to right-click on the setup execuable and choose 'Run as Administrator" in case elevateed privileges are needed for your user account. Alternatively, you could download the ZIP version and unzip it to any folder you like. Your StarReminder program has some useful features and I like the calendar display, but it does NOT work in Windows 10. It displays an error when run in Windows 10.
we have many users run StarReminder on Windows 10, without any problem. Is there any error message shown on screen? Can you send us a screenshot?